On a two-mile stretch of land in New York’s East River, a 19th-century horror story was unfolding . . . In the first contemporary investigative account of Blackwell’s, Stacy Horn tells this chilling narrative through the gripping voices of the island’s inhabitants, as well as the period’s officials, reformers, and journalists, including the celebrated Nellie Bly. Digging through city records, newspaper articles, and archival reports, Horn brings this forgotten history alive: there was terrible overcrowding; prisoners were enlisted to care for the insane; punishment was harsh and unfair; and treatment was nonexistent. Throughout the book, we return to the extraordinary Reverend William Glenney French as he ministers to Blackwell’s residents, battles the bureaucratic mazes of the Department of Correction and a corrupt City Hall, testifies at salacious trials, and in his diary wonders about man’s inhumanity to man. 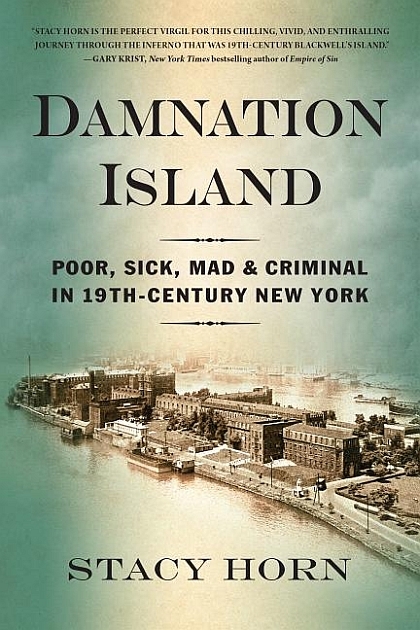 In Damnation Island, Stacy Horn shows us how far we’ve come in caring for the least fortunate among us—and reminds us how much work still remains. "[A] fascinating look at a piece of nearly forgotten New York City history—one that will make you thankful for modern conveniences." Stacy Horn is the author of five nonfiction books, including Imperfect Harmony. Mary Roach has hailed her for “combining awe-fueled curiosity with topflight reporting skills.” Horn’s commentaries have been heard on NPR’s All Things Considered and she is the founder of the social network Echo. She lives in New York City. Her website is stacyhorn.com.